It is important to say that the fallers do not constitute a group of countries for which all hope is lost. Certainly, people living in these countries face much insecurity, but some countries in this list, such as Malawi, have already begun a path to recovery. Malawi saw declining Safety and Security and Governance in 2011 following growing government oppression, yet since 2016 it has turned around and this year’s fall is very small in relative terms and compared to previous years. Each faller faced trigger events at various points in the last 10 years. The trigger events all preceded marked declines in prosperity that were sharp and steep. It should be noted that Venezuela’s decline has been much more precipitous than any other country in this group; its economy and overall prosperity has effectively collapsed. 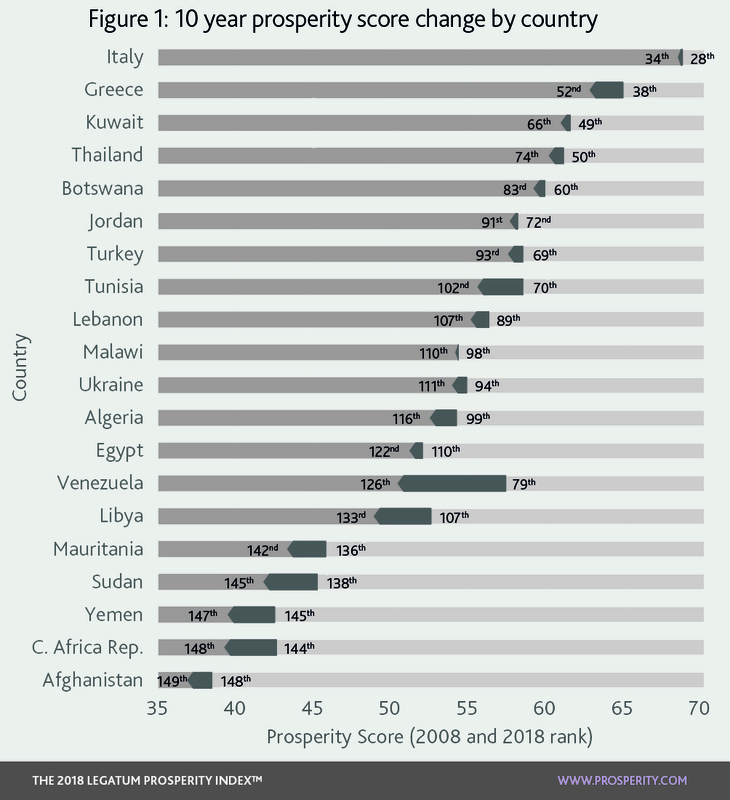 What connects the fallers, on average, is their extremely poor Personal Freedom score in 2008 (with the notable exceptions of Italy and Greece who score well on this pillar). Treating this group’s average scores as a country would place them at 97th in the global ranking, but trailing at 110th in the Personal Freedom pillar. This is something of an Achilles heel, as poor personal freedom and weak institutions make a nation more susceptible to external shocks. This lack of resilience can cause prosperity to fall across all pillars. Libya, for example, experienced a trigger event at the beginning of the second Libyan Civil War in 2014, following growing tensions the year prior, and this caused a fall across almost all pillars, over each of the past five years. A lack of Personal Freedom matters most when a country faces economic crisis. In the case of Italy and Greece, relatively good freedom scores and strong institutions have helped them to avoid the depth of crises endured by other nations in similar situations. Greece ranked 36th in Governance and 56th in Personal Freedom in 2008, whilst Italy ranked 41st and 28th respectively. Although the severity of their economic crises did cause significant damage over the following decade, they both avoided severe decline, particularly in the case of Italy. Once the ‘model democracy’ of Latin America, Venezuela is now unrecognisable, struggling to maintain law and order and to feed its divided people. It is also experiencing significant outflow of people to Colombia and Brazil, as Venezuelans seek to create their own personal pathways from poverty to prosperity. The nation’s decline has left it ranked worst in the world this year for both Business Environment and Governance. There are other scenarios that trigger decline: an economic shock or longer collapse as mentioned, and oppressive regimes, conflict and a breakdown in human security including a neighbouring conflict. 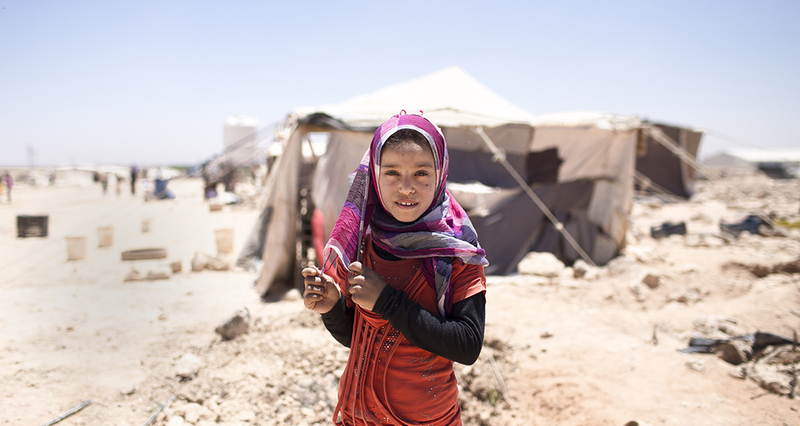 Conflict has been the biggest contributor to the global decline of Safety and Security, with more wars and terrorist violence around the globe, illustrated by a shocking rise in the number of deaths on the battlefield, 44,600 in 2018, an increase of 58% in the last 10 years. Deaths from terrorism have quadrupled to 27,800 in the same period. It has had a pronounced effect across MENA, Sub-Saharan Africa and even in Asia, where the Taliban continue their assault on Afghan citizens and security forces. In Yemen, the civil war has led to thousands of deaths and left millions in need of humanitarian assistance. In Sudan, conflict has also claimed the lives of many, as conflict rages between the Army of Sudan and the Sudanese People’s Liberation Movement. Following the 2011 uprising that toppled Ben Ali and heralded the Arab Spring, many hoped and believed that Tunisia was at the beginning of a positive transformation, but instead it has experienced a decline in all pillar scores since that point. Again, it is the deterioration of Safety and Security scores that has proved to be an unassailable roadblock on the nation’s path to prosperity and the success of its democracy. The 2015 Sousse terrorist attacks were illustrative of a sharp decline in Safety and Security, which has dropped to 77th this year, from 44th in 2011. Thailand is a unique nation by several measures. It is relatively prosperous, ranking 74th in the Index with a modern economy, flourishing tourism, and a growing middle class. The nation displays the hallmarks of a successful democracy with 61% of Thai citizens having confidence in the government and 59% confident in elections but democracy is exactly what it lacks. In fact, Thailand has had 14 attempted coups since the end of the Second World War, more than almost any other country in the world. In between these coups, violent political strife and government oppression of its people ensue. We can trace the recent decline of Thailand back to 2013 when a sizeable decline in the levels of confidence in government and satisfaction with personal freedom, and an increase in social hostilities became apparent. Growing unrest resulted in the overthrow of the government in 2014 by a military junta, who have yet to hand the nation back to its people via a democratic process. From 2014 to 2015 the sharpest declines manifested in a decrease of civil liberties and falling levels of democracy when the junta began prosecuting opponents of military rule, increased media censorship and introduced a nightly curfew. The long running political instability has prevented the nation from maintaining basic levels of human security. Thailand is the third most unequal country in the world with the top 1% richest individuals owning 58% of the wealth, and most people living in a large rural community. Interventionist military rule has resulted in political oppression and prevented any democratically elected government, bar one, from completing a full term throughout the history of Thailand’s democracy. Since the 2014 coup, levels of satisfaction with the standard of living have dropped alongside availability of food and shelter. Thais feel insecure and until the nation finds political stability and democratically elected leadership, it remains unclear how true reform can be implemented to rebuild safety and security, and the institutions to foster rising prosperity.